Product code: ES2779 Categories: Antique, Antique Rings, Art Nouveau Jewellery. The Art Nouveau period of the late 19th century early 20th century has such a free flowing design that took so much inspiration from nature as can be seen here in this wonderful ring from this period. 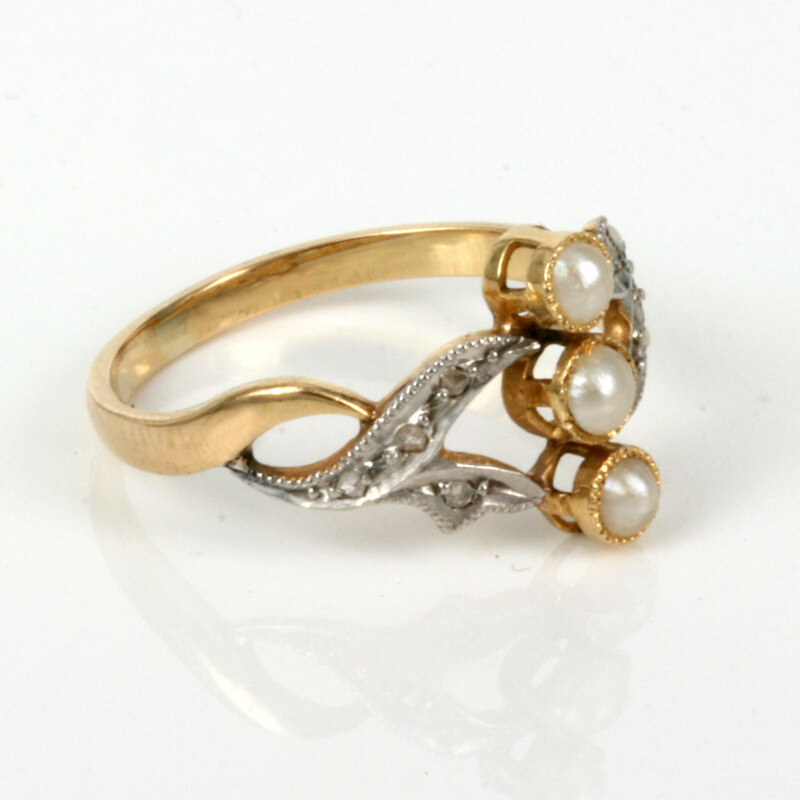 Made in France around 1900, the ring is set with 3 natural pearls and 4 rose cut diamonds on each side. The setting style is so unique and what makes Art Nouveau jewellery such as rings like this so popular. Art Nouveau jewellery is so unique and we find that rings such as this is popular for women of all ages. 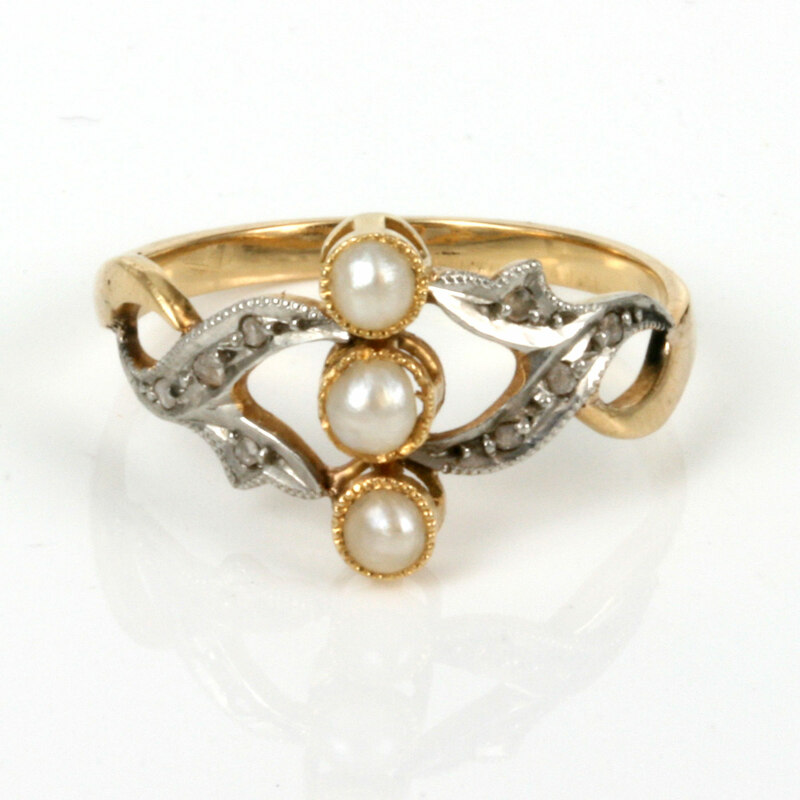 The width of this ring measures 11.4mm from one pearl at one end to the other end pearl and the style and design of this ring makes it looks sensational on a finger on its own and would also compliment a wonderful antique bracelet. French jewellers of this era produced some truly amazing designs that were often so unique and influenced so many other jewellers around the world, and as can be seen from the 4th image it has the French hallmarks on the outside of the band which is so typical of French rings. If you have been looking for a very attractive and unique antique ring especially from the Art Nouveau era that is set with pearls and diamonds then this antique ring could very easily be the one.